PRINCETON, N.J. -- Americans are evenly split when asked if the U.S. is No. 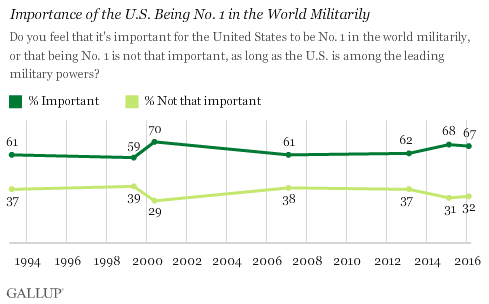 1 in the world militarily, with 49% saying "yes" and 49% saying "no." The current percentage who view the U.S. as No. 1 is, by a small margin, the lowest Gallup has recorded in its 23-year trend. 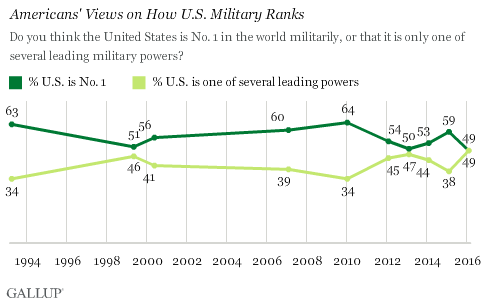 It also marks a significant downturn from last February, when 59% said the U.S. was the world's top military power. A separate question included in Gallup's Feb. 3-7 World Affairs poll asked Americans about the importance of the nation being No. 1 militarily. Two-thirds of Americans say it is important, in line with sentiments measured since Gallup first asked this question in 1993. As might be expected given the less positive views of U.S. military power, more Americans than in recent years say the country is spending too little on its military. In the February survey, 37% say the government in Washington is spending too little on "national defense and military purposes," up slightly from last year and the highest since before the 9/11 terrorist attacks. Even with this shift, however, the "spending too little" sentiment remains relatively low. Nearly as many, 32%, say the U.S. is spending "too much," and the remainder, 27%, say defense spending is "about right." 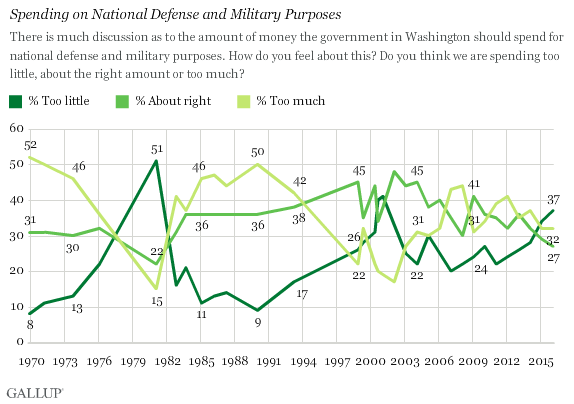 Gallup has asked this defense spending question since 1969, with responses fluctuating a good deal over the years. The broad patterns show that Americans' belief that military spending is too low rise after the real-world level of such spending goes down. This is evident in the sharp spike in views that the nation was spending too little on defense in January 1981, as newly elected President Ronald Reagan took office -- winning in part on a platform emphasizing the need to bolster the military to counter the growing Soviet threat. The "spending too little" measure also rose in February 2001 as newly elected President George W. Bush took office after a two-term Bill Clinton presidency in which military spending fell. U.S. military spending rose sharply after 9/11, peaking in 2010, and Americans' views that the government was spending too little on the military dropped concomitantly. Now that military spending has been dropping in the last several years because of sequestration and a reduced involvement in Iraq and Afghanistan, Americans' views that the U.S. is spending too little on defense have begun to increase. Defense and military spending have been a significant talking point for Republican presidential candidates this year, with most calling for a sharply increased military budget. Sen. Ted Cruz, for example, says, "In order to restore America's safety and security, we must rebuild our military. If you think defending the country is expensive, try not defending it." Donald Trump says he would "build up the military so nobody messes with us," and Marco Rubio says he would "work to … begin to undo the damage caused by $1 trillion in indiscriminate defense cuts." On the other hand, Democratic candidate Bernie Sanders says he has "very serious concerns about our nation's bloated military budget and ... misplaced national priorities." Rank-and-file Republicans across the country generally share the hawkish views of their party's presidential candidates, with about two-thirds agreeing that there is too little spending on the military. In sharp contrast, 20% of Democrats say the U.S. spends too little while 45% say the government spends too much. Independents are largely divided, but the greatest percentage of that group says the U.S. spends too much. The 10-point drop in the percentage of Americans who believe the U.S. is the No. 1 military power in the world may reflect worries about international terrorism, which the public views as the most critical international threat the nation faces. It may also reflect the discussion of the military and defense in the current presidential election campaign. The uptick in Americans' view that the nation is spending too little on its military may partly reflect these two dynamics, but also follows the classic ebb and flow of attitudes about military spending in response to ups and downs in the nation's actual spending. Although more Americans now than in the years after 9/11 say there is too little spending on defense, that percentage is nowhere near as high as it was immediately after the Jimmy Carter years when Reagan took office and began years of massively increased military spending. Nor is it as high as in the years just before 9/11. And even with the recent shifts in attitudes, the majority of Americans remain convinced that the nation's military budget is about right or is too high. Republicans' and Democrats' very different views on the current level of military spending suggest this could become a contentious issue in the general election this fall. As commander in chief, the president is a critical determinant of the nation's defense posture. This means the direction of military spending in the years ahead will be quite different, depending on whether a Republican or a Democrat is elected in November, and the public's attitudes about the strength of the U.S. military will most likely follow in turn.